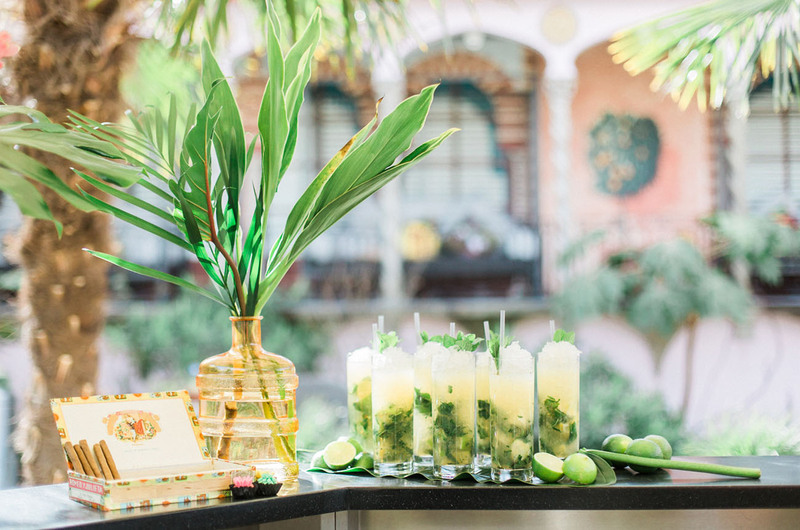 When the US got friendly with Cuba again, the lightbulbs went on for wedding planner + stylist, Revelry Events. 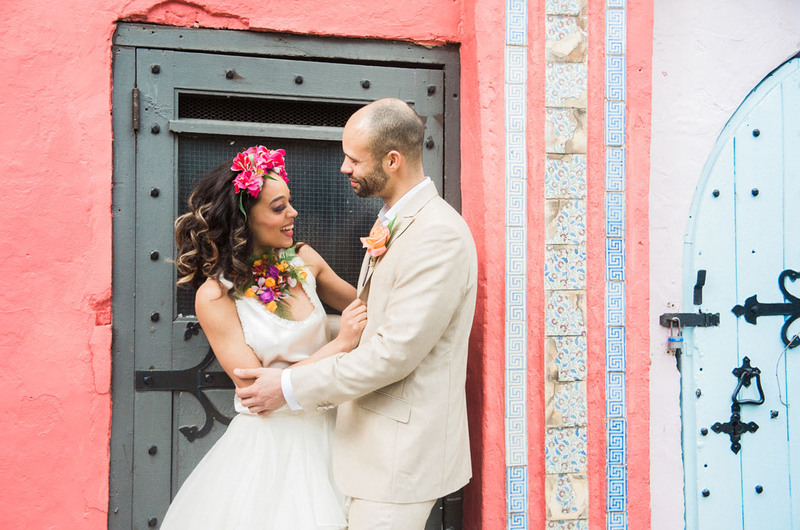 Capturing the essence of Old Havana — the music, the dancing, the cigars and mojitos — all against a charming backdrop of colonial architecture, made for one vibrant + flirtatious editorial! A big part of the Cuban-inspired look has to do with the vintage details: old cigar boxes, timeworn wooden trays, and rustic candleholders. 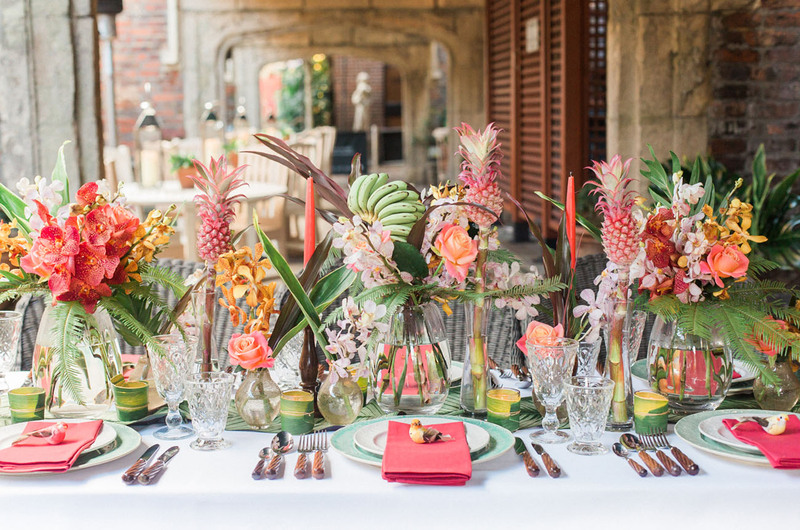 To reflect the 1950s time capsule that is Cuba, the palette consisted of muted colors, complemented by lush greenery, faded peach florals, and vibrant coral candles. Ready to be transported to Old Havana with photos by Xander and Thea? Let’s go! 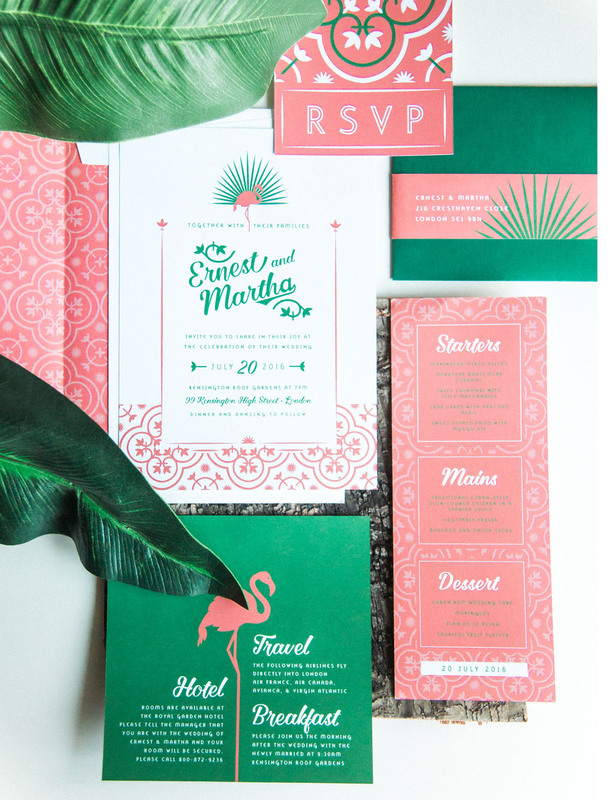 The invitation suite by Jennifer’s Paper truly set the tone for the day. 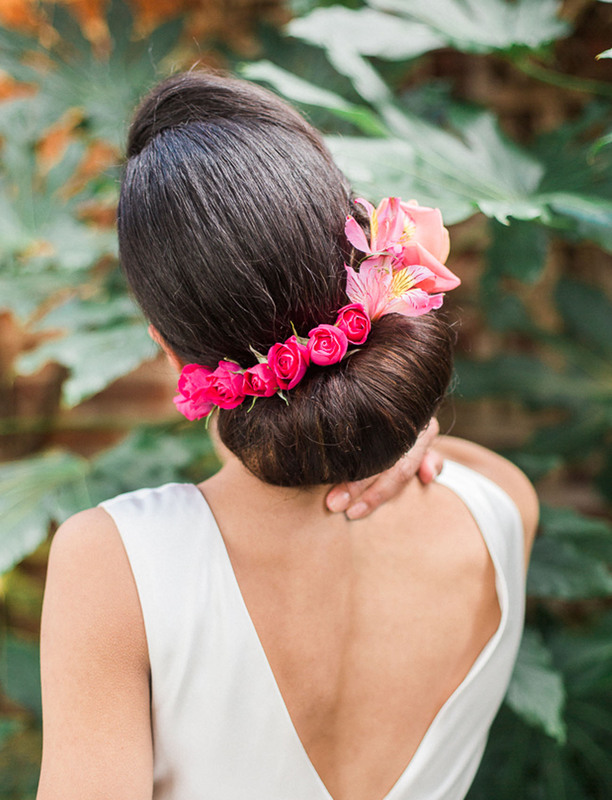 For this shoot, we wanted to experiment with floral jewelry, as well as working flowers into the hairstyles by Patricia Soper. 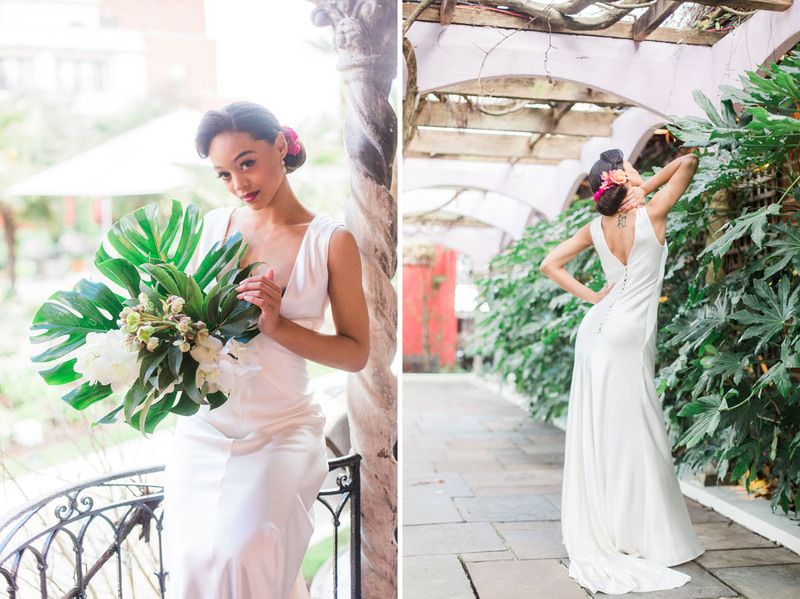 This is a great option if you are wearing a fairly plain dress, or perhaps you don’t want to carry a traditional bouquet, and it’s absolutely ideal for destination weddings. 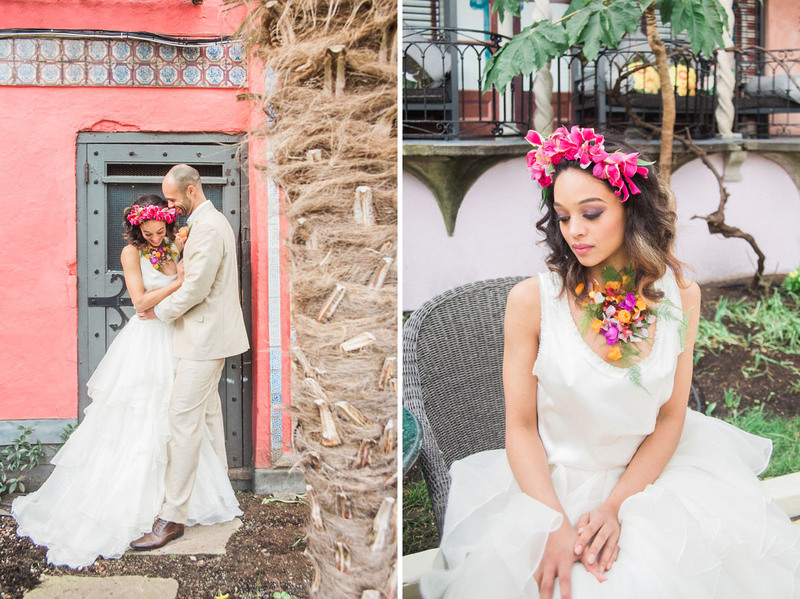 The Mary Jane Vaughan team created the most exceptional florals for the shoot that definitely added to the Old Havana vibe. 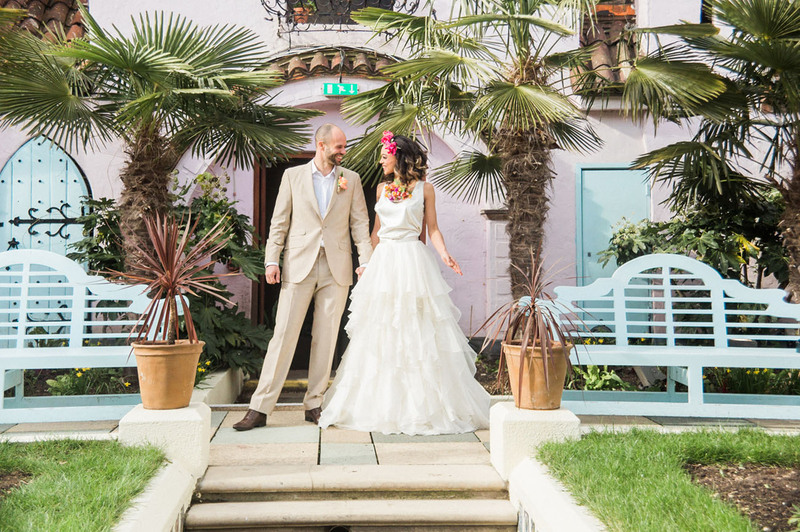 No one would ever guess that this wasn’t a tropical location, let alone London! 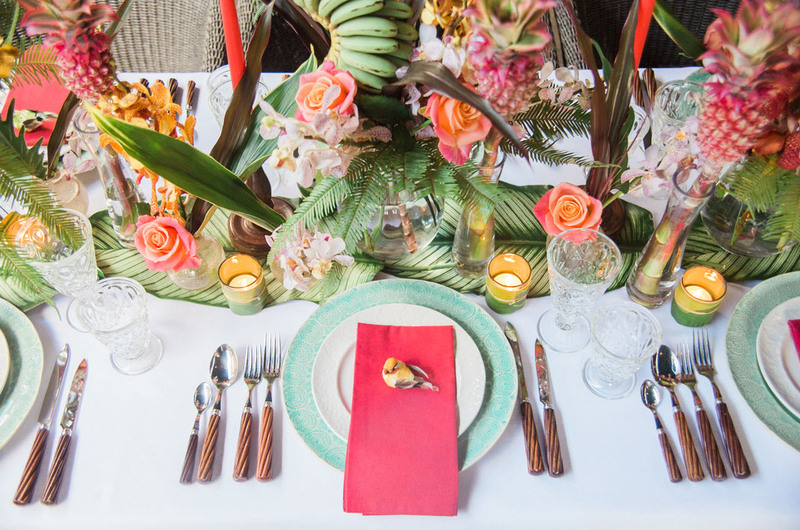 We used little tropical bird details on the coral napkins, and on the dining table we put together vintage-looking goblets and vases with muted teal plates and wooden cutlery. We didn’t want it to look polished, but rather like a curated collection, as if we had just found a lot of what we used. Like an impromptu Cuban wedding! Such a stunning backdrop!! 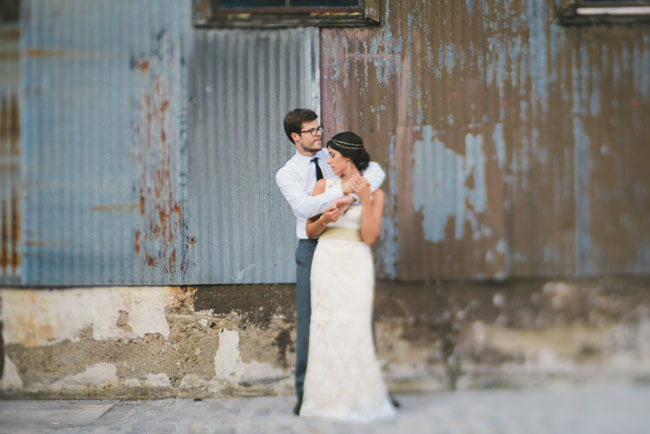 Revelry Events shares Our advice for brides would be to try something totally different. Experiment with a reception look that almost looks ‘thrown together’, to encourage your guests to feel relaxed + comfortable throughout the whole day! 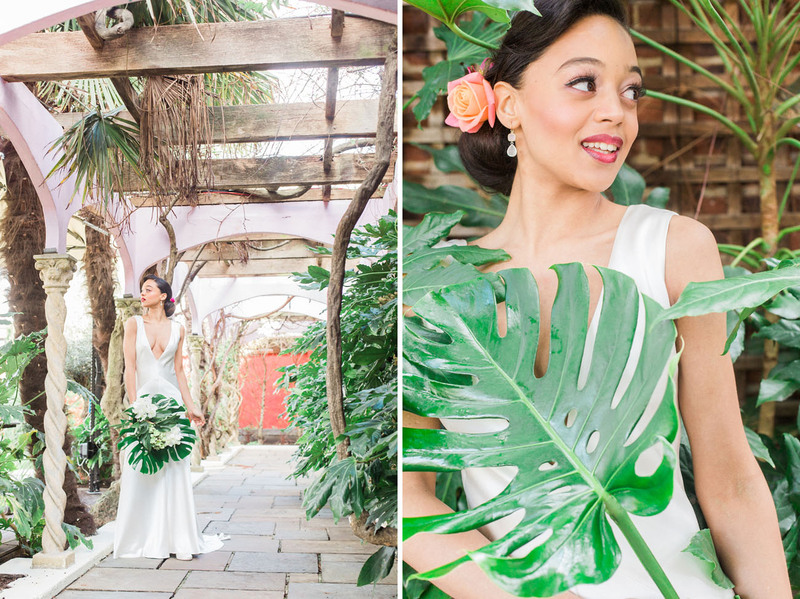 The bride wore the Priya skirt + Asha top from Watters. How fun + flirty is this outfit, especially with all the ruffled layers? Perfect for dancing! 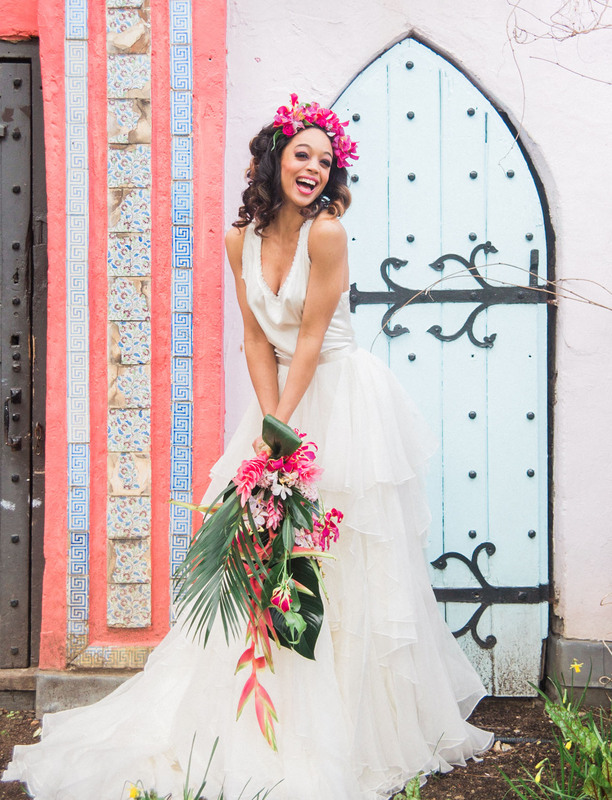 The real showstopper was the bouquet by Mary Jane Vaughan Designs of palm + heliconia. 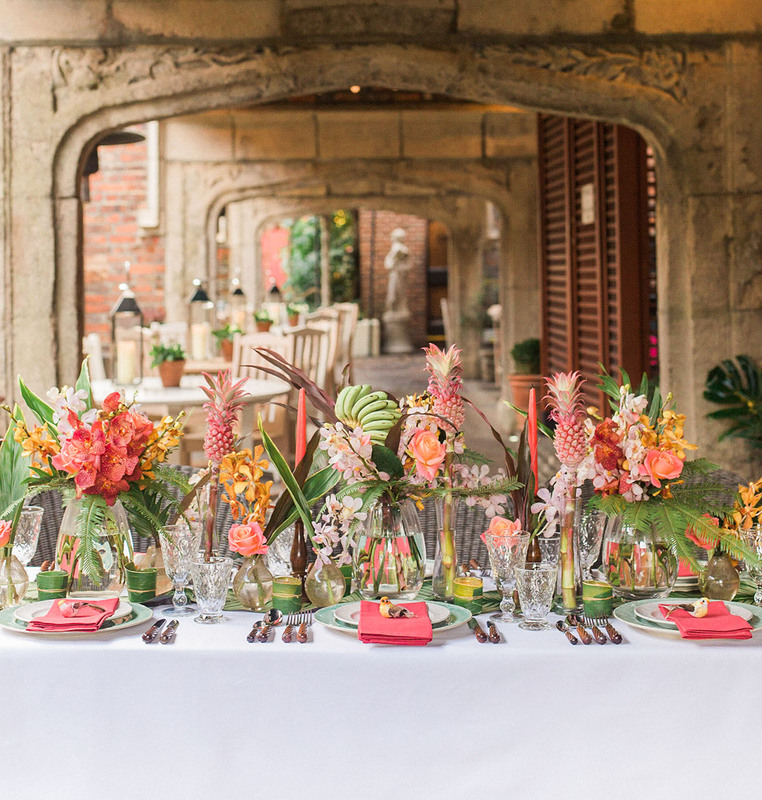 It mixed perfectly with the gloriosa, lilies, orchids in hot pink, coral and orange. So exotic + beautiful! 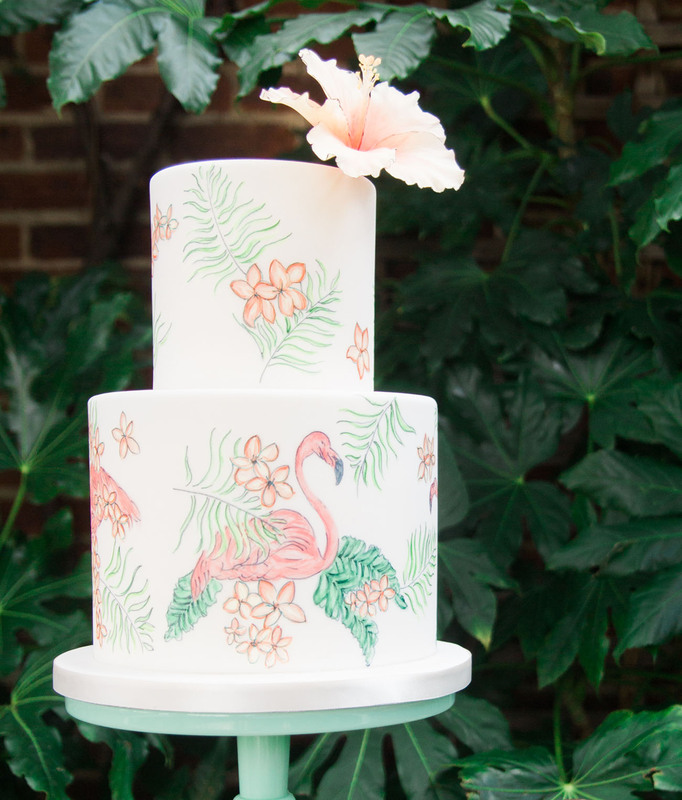 The night was topped off with this hand painted flamingo + tropical-inspired cake by The Cake Parlour, along with a ‘Cocktails, Chocolates + Cigar Bar’. So fun, right? So is anyone else thinking a trip to Cuba might be necessary? 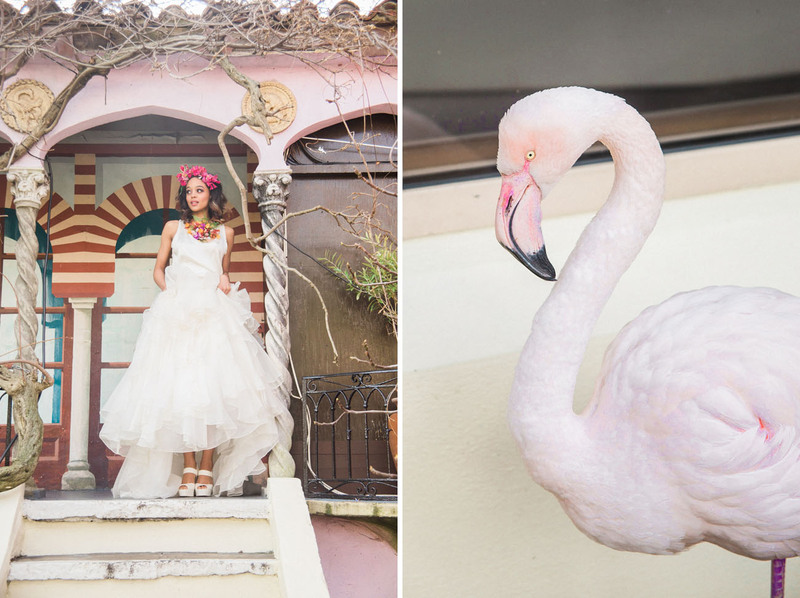 A huge thank you to the team behind this shoot for creating such dreamy inspiration! Want a little bit more? Check out this clip by Insta Wedding! Everything looks fabulous! Havana decor is a treasure!